A liquid is in equilibrium with its vapour in a sealed container at a fixed temperature. The volume of the container is suddenly increased. What is Kc for the following equilibrium when the equilibrium concentration of each substance is: [SO2]= 0.60 M, [O2] = 0.82 M and [SO3] = 1.90 M ? Hence, Kcfor the equilibrium is . Explain why pure liquids and solids can be ignored while writing the equilibrium constant expression? If a mixture of 0.482 mol of N2 and 0.933 mol of O2 is placed in a 10 L reaction vessel and allowed to form N2O at a temperature for which Kc = 2.0 × 10–37, determine the composition of equilibrium mixture. The value of equilibrium constant i.e., = 2.0 × 10–37 is very small. Therefore, the amount of N2and O2 reacted is also very small. Thus, x can be neglected from the expressions of molar concentrations of N2 and O2. At 450 K, Kp= 2.0 × 1010/bar for the given reaction at equilibrium. A sample of HI(g) is placed in flask at a pressure of 0.2 atm. At equilibrium the partial pressure of HI(g) is 0.04 atm. What is Kp for the given equilibrium? Since , the reaction mixture is not at equilibrium. Again, . Hence, the reaction will proceed in the reverse direction. is 54.8. If 0.5 molL–1 of HI(g) is present at equilibrium at 700 K, what are the concentration of H2(g)and I2(g) assuming that we initially started with HI(g) and allowed it to reach equilibrium at 700 K? What is the equilibrium concentration of each of the substances in the equilibrium when the initial concentration of ICl was 0.78 M? Kp = 0.04 atm at 899 K for the equilibrium shown below. What is the equilibrium concentration of C2H6 when it is placed in a flask at 4.0 atm pressure and allowed to come to equilibrium? Since , equilibrium has not been reached. A sample of pure PCl5 was introduced into an evacuated vessel at 473 K. After equilibrium was attained, concentration of PCl5 was found to be 0.5 × 10–1 mol L–1. If value of Kc is 8.3 × 10–3, what are the concentrations of PCl3 and Cl2 at equilibrium? One of the reactions that takes place in producing steel from iron ore is the reduction of iron (II) oxide by carbon monoxide to give iron metal and CO2. What are the equilibrium partial pressures of CO and CO2 at 1050 K if the initial partial pressures are: pCO = 1.4 atm and = 0.80 atm? Since , the reaction will proceed in the backward direction. At a particular time, the analysis shows that composition of the reaction mixture is 3.0 mol L–1 N2, 2.0 mol L–1 H2 and 0.5 mol L–1 NH3. Is the reaction at equilibrium? If not in which direction does the reaction tend to proceed to reach equilibrium? Since , the reaction is not at equilibrium. Since , the reaction will proceed in the forward direction to reach equilibrium. for which Kc= 32 at 500 K. If initially pure BrCl is present at a concentration of 3.3 × 10–3 molL–1, what is its molar concentration in the mixture at equilibrium? 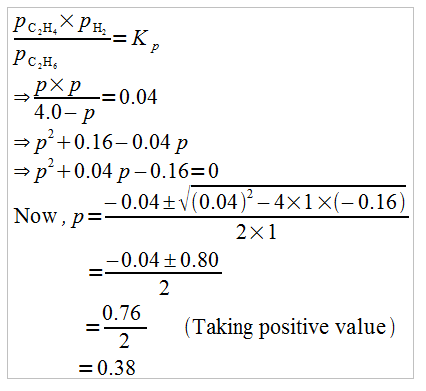 Does the number of moles of reaction products increase, decrease or remain same when each of the following equilibria is subjected to a decrease in pressure by increasing the volume? Which of the following reactions will get affected by increasing the pressure? The equilibrium constant for the following reaction is 1.6 ×105 at 1024 K.
If the value of Kc lies between 10–3 and 103, a reaction has appreciable concentration of reactants and products. Thus, the reaction given in (c) will have appreciable concentration of reactants and products. is 2.0 ×10–50 at 25°C. If the equilibrium concentration of O2 in air at 25°C is 1.6 ×10–2, what is the concentration of O3? The reaction, CO(g) + 3H2(g) CH4(g) + H2O(g) is at equilibrium at 1300 K in a 1L flask. It also contain 0.30 mol of CO, 0.10 mol of H2 and 0.02 mol of H2O and an unknown amount of CH4 in the flask. Determine the concentration of CH4 in the mixture. The equilibrium constant, Kc for the reaction at the given temperature is 3.90. It is given that Kc = 3.90. Hence, the concentration of CH4 at equilibrium is 5.85 × 10–2 M.
What will be the conjugate bases for the Brönsted acids: HF, H2SO4 and HCO3? Write the conjugate acids for the following Brönsted bases: NH2–, NH3 and HCOO–. The species: H2O, , and NH3 can act both as Brönsted acids and bases. For each case give the corresponding conjugate acid and base. Classify the following species into Lewis acids and Lewis bases and show how these act as Lewis acid/base: (a) OH– (b) F– (c) H+ (d) BCl3. (a) OH– is a Lewis base since it can donate its lone pair of electrons. The concentration of hydrogen ion in a sample of soft drink is 3.8 × 10–3 M. what is its pH? The pH of a sample of vinegar is 3.76. Calculate the concentration of hydrogen ion in it. Hence, the concentration of hydrogen ion in the given sample of vinegar is 1.74 × 10–4 M.
The ionization constant of HF, HCOOH and HCN at 298K are 6.8 × 10–4, 1.8 × 10–4 and 4.8 × 10–9respectively. Calculate the ionization constants of the corresponding conjugate base. The ionization constant of phenol is 1.0 × 10–10. What is the concentration of phenolate ion in 0.05 M solution of phenol? What will be its degree of ionization if the solution is also 0.01M in sodium phenolate? Now, let ∝ be the degree of ionization of phenol in the presence of 0.01 M C6H5ONa. The first ionization constant of H2­­S is 9.1 × 10–8. Calculate the concentration of HS– ion in its 0.1 M solution. How will this concentration be affected if the solution is 0.1 M in HCl also? If the second dissociation constant of H2S is 1.2 × 10–13, calculate the concentration of S2– under both conditions. In the presence of 0.1 M of HCl, let be y M.
The ionization constant of acetic acid is 1.74 × 10–5. Calculate the degree of dissociation of acetic acid in its 0.05 M solution. Calculate the concentration of acetate ion in the solution and its pH. It has been found that the pH of a 0.01M solution of an organic acid is 4.15. Calculate the concentration of the anion, the ionization constant of the acid and its pKa. The degree of ionization of a 0.1M bromoacetic acid solution is 0.132. Calculate the pH of the solution and the pKa of bromoacetic acid. The pH of 0.005M codeine (C18H21NO3) solution is 9.95. Calculate its ionization constant and pKb. What is the pH of 0.001 M aniline solution? The ionization constant of aniline can be taken from Table 7.7. Calculate the degree of ionization of aniline in the solution. Also calculate the ionization constant of the conjugate acid of aniline. Thus, the ionization constant of the conjugate acid of aniline is 2.34 × 10–5. Calculate the degree of ionization of 0.05M acetic acid if its pKa value is 4.74. The ionization constant of dimethylamine is 5.4 × 10–4. Calculate its degree of ionization in its 0.02 M solution. What percentage of dimethylamine is ionized if the solution is also 0.1 M in NaOH? The pH of milk, black coffee, tomato juice, lemon juice and egg white are 6.8, 5.0, 4.2, 2.2 and 7.8 respectively. Calculate corresponding hydrogen ion concentration in each. If 0.561 g of KOH is dissolved in water to give 200 mL of solution at 298 K. Calculate the concentrations of potassium, hydrogen and hydroxyl ions. What is its pH? The solubility of Sr(OH)2 at 298 K is 19.23 g/L of solution. Calculate the concentrations of strontium and hydroxyl ions and the pH of the solution. The ionization constant of propanoic acid is 1.32 × 10–5. Calculate the degree of ionization of the acid in its 0.05M solution and also its pH. What will be its degree of ionization if the solution is 0.01M in HCl also? In the presence of 0.1M of HCl, let α´ be the degree of ionization. The pH of 0.1M solution of cyanic acid (HCNO) is 2.34. Calculate the ionization constant of the acid and its degree of ionization in the solution. The ionization constant of nitrous acid is 4.5 × 10–4. Calculate the pH of 0.04 M sodium nitrite solution and also its degree of hydrolysis. The ionization constant of chloroacetic acid is 1.35 × 10–3. What will be the pH of 0.1M acid and its 0.1M sodium salt solution? It is given that Ka for ClCH2COOH is 1.35 × 10–3. Ionic product of water at 310 K is 2.7 × 10–14. What is the pH of neutral water at this temperature? Since there is neither an excess of or , the solution is neutral. Hence, pH = 7. Determine the solubilities of silver chromate, barium chromate, ferric hydroxide, lead chloride and mercurous iodide at 298K from their solubility product constants given in Table 7.9 (page 221). Determine also the molarities of individual ions. Let the solubility of be s.
The solubility product constant of Ag2CrO4 and AgBr are 1.1 × 10–12 and 5.0 × 10–13 respectively. Calculate the ratio of the molarities of their saturated solutions. Let s´ be the solubility of AgBr. Equal volumes of 0.002 M solutions of sodium iodate and cupric chlorate are mixed together. Will it lead to precipitation of copper iodate? (For cupric iodate Ksp = 7.4 × 10–8). Since the ionic product (1 × 10–9) is less than Ksp (7.4 × 10–8), precipitation will not occur. The ionization constant of benzoic acid is 6.46 × 10–5 and Ksp for silver benzoate is 2.5 × 10–13. How many times is silver benzoate more soluble in a buffer of pH 3.19 compared to its solubility in pure water? Thus, the solubility of silver benzoate in a pH 3.19 solution is 1.66 × 10–6 mol/L. What is the maximum concentration of equimolar solutions of ferrous sulphate and sodium sulphide so that when mixed in equal volumes, there is no precipitation of iron sulphide? (For iron sulphide, Ksp = 6.3 × 10–18). Let the maximum concentration of each solution be x mol/L. After mixing, the volume of the concentrations of each solution will be reduced to half i.e., . If the concentrations of both solutions are equal to or less than 5.02 × 10–9 M, then there will be no precipitation of iron sulphide. What is the minimum volume of water required to dissolve 1g of calcium sulphate at 298 K? (For calcium sulphate, Ksp is 9.1 × 10–6). The concentration of sulphide ion in 0.1M HCl solution saturated with hydrogen sulphide is 1.0 × 10–19 M. If 10 mL of this is added to 5 mL of 0.04 M solution of the following: FeSO4, MnCl2, ZnCl2and CdCl2. in which of these solutions precipitation will take place?